Advances in technology allow a greater quantity of polymer, the material that locks in fluid. The result is a very thin, but strong pad which provides the optimal combination of comfort, dryness, odor neutralizing and absorbency! The moisture proof barrier placed within the pad gives an outer cloth like feel. 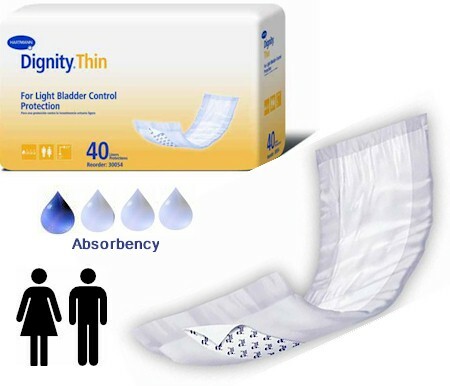 Dignity Thins are discreet, easy to use, economical, comfortable, have no rustling sounds, and are undetectable under clothing. Forty pads with adhesive strip in each bag. Forty pads with adhesive strips in each bag. Six bags to the case. Purchase by the bag or for special pricing, order in case quantities. The former name was Dignity Thinserts. A picture of the old packaging can be seen by clicking on "more pictures" above. Our stock inventory will continue with the old packaging until sold out. Dimensions of each Thins pad is 3.5" x 12"
Shop carefully, this item is not returnable if opened.